Pura Dalem Agung is one of the three famous Hindu temples in the popular Sacred Monkey Forest Sanctuary. It is located in the southwestern part of the forest and deemed to be the main temple out of all. The place sees hordes of visitors every day who come here to pay their offerings to Lord Hyang Widhi, the personification of Lord Shiva. Many people estimated it to be built around 1350 just like its other counterparts but the real timings of its establishment are still unknown. Peace seekers and spiritual people can come here to find some peace of mind and enlightenment that is otherwise hard to find in the concrete world. Spare a few hours to explore the place and then relax afterwards in one the Ubud Monkey Forest’s five group of Crab Eating Macaques. Bali tours ideally do not include a visit to Pura Dalem Agung. Fine Accommodation options like Yulia Village Inn Ubud, Bije Sari Suite Bisma, Batu Empug Ubud and Gatra Ubud Inn will meet your requirement of where to stay in Bali. If you want to add the visit to Pura Dalem Agung in your trip, you can choose from the variety of Bali vacation packages that can be designed to suit your preferences. These packages also cover your major concern of how to reach Bali. You only need to wear a sarong with a scarf tie on your waist. Entry to the temple is free but you will need to buy the entry pass to the forest it resides in. Free entry in the temple. 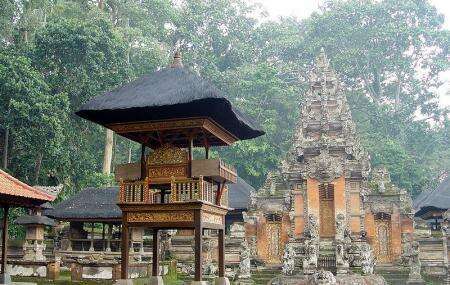 Timings of temple is as same as the timings of the Ubud Monkey forest. How popular is Pura Dalem Agung? People normally also visit Bali Zoo while planning their trip to Pura Dalem Agung. Pura Dalem Agung Padangtegal, or Padangtegal Great Temple of Death, is one of three Hindu templesmaking up a temple complex located in the Sacred Monkey Forest Sanctuary. Also called the "Main Temple," Pura Dalem Agung Padangtegal is used for worshiping the god Hyang Widhi in personification of Shiva, the Recycler or Transformer. Like the other two temples in the complex, it is thought to have been built around 1350. Very often the temple is closed but you could see the majority of the complex as the gate is low and the grill doesn't spoil the view. This is also monkey temple situated inside a forest. You have to take help of local people to enter it. Locals have their shops inside the forest and offer goods at cheap rate. You can also take snaps wearing traditional dress. Nice temple inside monkey forest. Not open for tourists to go inside. Local people who want to go to pray can go inside. But you can see from outside. Forest with a lot of monkey's that can do whatever they want. Best time to visit is after sunrise when they just had breakfast. During daytime it's really hot in the forest and that also affects the monkeys. They're more agressive and if you have some loose things with you they'll try to steal it, like hats, glasses, bottles of water etc. we saw real monkeys who are very free to do whatever they want. it was fun watching them steal stuff from chinese fellows, sun glassess and hair of european girls 😂 one of the most striking thing to see was the monkey cemetary. we prayed for the monkeys. we love them all. peace.